"Touchdown confirmed. We're safe on Mars!" a mission controller announced to deafening cheers here at NASA's Jet Propulsion Laboratory (JPL). Rover team members leapt to their feet to hug and high-five each other. Then, a few minutes later, Curiosity's first photo — a fuzzy thumbnail showing one of the huge rover's six wheels on the Martian surface — came down to Earth, sparking another eruption of emotion. This first image from the Mars rover Curiosity on the surface of Mars shows the rover's shadow as seen by a navigation camera. NASA released the image just minutes after the rover's successful Aug. 5 PDT, 2012 landing. Curiosity survived a harrowing and unprecedented journey to the Red Planet's surface. After hurtling into the Martian atmosphere at 13,000 mph late Sunday (21,000 kph), Curiosity's spacecraft deployed an enormous supersonic parachute to slow down to 200 mph (320 kph) or so. The vehicle then fired rockets to slow its descent further, to less than 2 mph (3.2 kph). A rocket-powered sky crane lowered Curiosity to the Martian surface on cables, then flew off and crash-landed intentionally a safe distance away after the rover's six wheels hit the red dirt. The ambitious maneuver capped a landing sequence that NASA officials have dubbed "seven minutes of terror." With the landing, the Curiosity rover wrapped up an eight-month voyage across 352 million miles to reach Mars, where the robot now faces an ambitious two-year mission. The successful landing is a huge moment for NASA and the future of robotic planetary exploration, which is imperiled by budget cuts. NASA is counting on Curiosity's $2.5 billion mission — which is officially known as the Mars Science Laboratory, or MSL — to generate excitement about the agency's exploration efforts and, perhaps, bring some of the lost funding back. "We're on Mars again," NASA chief Charlie Bolden said just minutes after Curiosity touched down. "It doesn't get any better than this." JPL technicians react to the news that Curiosity has landed on Mars, August 6, 2012. Curiosity can now get to work. Its main task is to determine if the Gale Crater area is, or ever was, capable of supporting microbial life. It sports 10 scientific instruments to aid in this task, including a rock-zapping laser and gear that can identify organic compounds, the carbon-containing building blocks of life as we know it. A mysterious 3-mile-high (5 kilometer) mountain called Mount Sharp rises from Gale's center. Mount Sharp's many layers preserve a record of Mars' environmental conditions going back perhaps 1 billion years or more, scientists say. Curiosity will read these layers like a book to gain insights about how the Red Planet has changed over time. Mars-orbiting spacecraft have spotted signs of clays and sulfates — materials known to form in the presence of water — in Mount Sharp's lower reaches. Since all life on Earth is intimately tied to water, Curiosity will doubtless spend a lot of time poking around the mound's base. But the MSL team also wants the rover to climb high enough to reach the mountain's drier layers, so it can help investigate why Mars transitioned from a relatively warm and wet planet to the frigid and dry world we know today. To cross the wet-dry threshold, Curiosity will likely have to climb about 2,300 feet (700 meters) up Mount Sharp. But that shouldn't be too difficult, as the mountain has relatively gentle slopes, like the huge volcanoes of Hawaii, Grotzinger said. 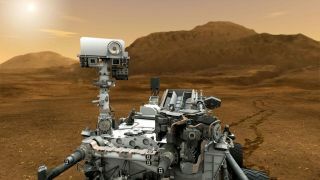 In fact, it's possible the rover could clamber all the way to Mount Sharp's top, given enough time, officials have said. But this mountaineering feat isn't high on the MSL team's list of priorities right now. Curiosity's not quite ready to go roving yet. The robot's handlers must first perform a series of checkouts to make sure the rover and its instruments are in good working condition on the Martian surface. It will likely be two to four weeks before Curiosity begins "contact science" operations, said MSL project manager Pete Theisinger of JPL. Such work involves examining rocks and soil with the rover's Alpha Particle X-ray Spectrometer and its Mars Hand Lens Imager, which functions like a high-powered magnifying glass. It will probably be one to two months before Curiosity drops the first soil samples into its internal analytical instruments, Theisinger added. And the rover likely won't be ready to start the drive toward Mount Sharp for two or three months, Grotzinger said. "On Sunday night, at 10:32, OK, we will have a priceless, priceless asset that we have placed on the surface of another planet that could last a long time if we operate it correctly," Theisinger told reporters Thursday (Aug. 2). "And so we will be cautious as hell about what we do with it." Curiosity's prime mission is slated to last one Martian year, or roughly two Earth years. But the rover's plutonium power source could keep it going for a decade or more, provided key parts don't break down. Such longevity wouldn't be unprecedented for a NASA Mars rover. The twin robots Spirit and Opportunity, after all, were supposed to explore the Red Planet for three months when they touched down in January 2004. Spirit stopped communicating with Earth in March 2010, and Opportunity is still going strong. "We are going to have the opportunity for untold discoveries," Doug McCuistion, head of NASA's Mars Exploration program, said before Curiosity's landing Sunday. "It's going to be exciting, with years of exploration coming." NASA is expecting big things from Curiosity. The rover's discoveries should help lay the foundation for a concerted life-detection mission, which would likely involve sending samples of Martian soil and rock to Earth for study, agency officials have said. Martian sample-return would likely cost several billion dollars, however, putting it out of NASA's reach for the forseeable future. The space agency temporarily shelved all plans for such ambitious, expensive "flagship" planetary missions after the White House released its 2013 federal budget request in February. This request cut NASA's planetary science efforts by 20 percent, from $1.5 billion this year to $1.2 billion next year, with further cuts expected in the coming years. Much of this money will come out of the agency's Mars program, which sees its funding fall from $587 million this year to $360 million in 2013, and then to just $189 million in 2015. But NASA thinks this budget outlook could improve if Curiosity performs as advertised. Curiosity's discoveries might generate enough enthusiasm among the public and politicians to restore some of the lost funding, officials have said. "I think the way to recover the program is to have a much broader community understand the value, and we have a huge opportunity with MSL landing — where there'll be a lot of visibility, some real discoveries, some really interesting discoveries — to talk about the exciting work that leverages the science," John Grunsfeld, NASA's associate administrator for science, said in March. Curiosity launched from Florida's Cape Canaveral Air Force Station on Nov. 26, 2011. The mission was originally slated to blast off in 2009, but technical setbacks pushed things back two years to the next available Mars launch window.